Our firm is an investment company in the field of housing construction. It was set up in 2004. 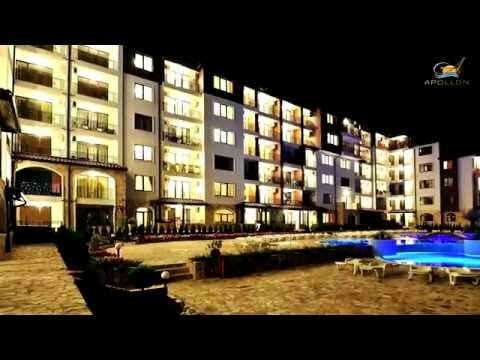 We have invested in projects and have constructed APOLON 1, 2, 3, 4, 5, 6, 7, 8, APOLLON NESSEBAR at Nessebar and newest APOLLON 9. We are well established on the British, Irish and Russian markets. Our team of highly qualified and experienced professionals has won the confidence of the clients. APOLON housing estates are well known on the market and they have proved to be good value for money. The apartments for sale are brick construction; they are fully completed with an equipped kitchen. We offer to our clients as additional services – furniture packs, maintaining the complex, connecting the owners with a rent company, where you can rental your apartment, low services and free consultations. Crystal clear sea air, golden sand beaches, splash of waves, seagulls’ shrieks, to which you’d love to wake up, natural and ecologically clean products. The vacation you have dreamt of is now a reality on the Black Sea coast in Bulgaria – in “Apolon” Complex. “Apolon” – this is not just residential complexes, perfectly situated at the seaside and ideal for a family vacation, “Apolon” – this is a space of harmony and comfort for connoisseurs of the beautiful, serene and comfortable vacation for you and your children. 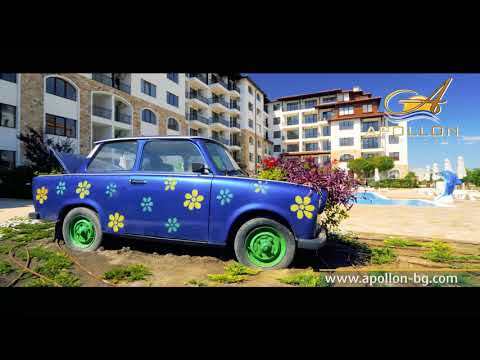 “Apolon” is located in a prestigious region on the southern Black Sea coast of Bulgaria, close to the fascinating town of Nessebar and just 20 minutes away from the modern Bourgas Airport. The long sand beach is only 200 metres away. From the complex to the aqua park, which has numerous water attractions and games, the distance is not more than 300 metres. This unique location is ideal for a quiet and nice family vacation, away from the city noise. If you decide to get into the town – 2 kilometres away from “Apolon” is the town of Nessebar, one of the most ancient and beautiful European cities, and 3 kilometres away is the Sunny Beach Resort complex, with its loud night life. At the present moment, “Apolon” consists of nine almost fully inhabited residential complexes with a well developed and functioning infrastructure. All buildings are equipped with elevators nevertheless the fact that every one of them is not more than 4 – 5 floors high. The apartments are being sold fully finished and ready to use, equipped with kitchen furniture, a fridge, an air conditioner and a furnished bath with a toilet. At customer’s request, a washing machine and dishwasher can be installed. Spectacular swimming pools, in which children prefer to spend most of their time. At this moment you can’t find any swimming pools like those in the region. For the parents are supplied tables, umbrellas and lounges which can be used for free by the owners of apartments in the complex. Children’s playgrounds are covered with a unique cover and there are all kinds of facilities and attractions for the children. A grocery store where you can find everything you need if you prefer to cook the food yourselves. Free to use sea sand beach and an aqua park as well and all that is only a five-minute walk. “Apolon“ Complex offers a great variety of apartments for everyone: from cozy studios to spacious apartments with several bedrooms with the possibility several apartments to be united together or you can make changes in plans while still in the process of construction. By acquiring an apartment in “Apolon“ you can be sure that your vacation won’t be disturbed by any problems. Only high quality materials are used for construction of the buildings. The walls are made of bricks securing high level of noise and heat insulation. The apartments are fully finished, and at customer’s request, they can be furnished with all needed furniture and equipment. Unlike many other complexes, “Apolon“ offers the possibility for an all year round residence. The whole infrastructure is functioning not only in the Summer but throughout all seasons as well. The owners of a property in “Apolon“ can be sure about the quality and the reliability of the residence they have bought. The complex is under security all the time. The managing company solves immediately any problems that have arisen and also assists the owners with organization of their initial settlement. And as for the legal side of the transaction, the investor has a law firm that will prepare all needed documents for closing of the deal and issuing of Title Deeds. “Apolon“ Complex combines in itself everything needed for a wonderful family vacation and a possibility for a permanent residence – pleasant Bulgarian climate, easy reachable sea that is just a few meters away from the complex, convenient infrastructure, fresh food stuffs all year round, and there is always a great company for you and your children. By acquiring an apartment in “Apolon“ you not only acquire the status of an owner of a prestigious property but you also give your loved ones numerous great and unforgettable emotions, you get the chance to strengthen your health as well and to enjoy everything that is needed for one first class vacation.